With MoonWorld learners can take a new approach to experiential learning, one that can't be duplicated in a classroom or through a normal website. MoonWorld is a simulation located in the Second Life® virtual world created by its residents. The NASA-sponsored Classroom of the Future has developed MoonWorld to provide useful information regarding the effectiveness of virtual worlds as experiential learning environments. The results of our testing will tell us to what extent the virtual experiences offered in MoonWorld result in meaningful learning. Beyond that, we hope that MoonWorld will become a successful tool to help learners of all ages experience and understand the Moon. Here's how MoonWorld works. In Second Life visitors create avatars, which then explore the 1.5 billion square meters of three-dimensional landscape. 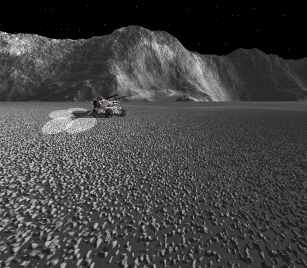 The MoonWorld simulation gives users—through their avatars, of course—the chance to take part in authentic scientific inquiry as they seek solutions to lunar challenges. The MoonWorld island—actually located in the Second Life sky, just like our real Moon—depicts lunar impact craters and volcanic features with geologic characteristics and interrelations that can be discerned through careful observation and measurement. For example, clues to the formation of an impact crater come from sampling rocks exposed along the crater rim and central peaks. Walking down the inner walls reveals—to a careful observer—terraces with fault scarps and ponded impact melt, evidence that the crater was modified by wall collapse and splashed by late stage melt. Nearby features include lava flow fronts that cover some of the crater's secondaries, establishing a stratigraphic relation. A sinuous rille, volcanic dome, and a dark halo crater offer chances to understand volcanic landforms, but they also include a trick, for the dark halo results from an impact crater excavating buried mare lava. The lava flows are modeled after the fresh ones in western Mare Imbrium. Avatars are able to climb into the sinuous rille and onto the dome and dark halo crater to investigate their morphologies. Avatars who visit MoonWorld teleport into a lunar habitat where they are issued a spacesuit before they can go through the airlock to the lunar surface. In addition to being a cool piece of clothing, the spacesuit gives the property of reduced gravity to better emulate the real Moon, and the suit contains a jet pack for flying. The spacesuit also accepts different instrument packages, such as magnetometers, gravimeters, and multispectral imagers, and a heads-up display to visualize those measurements in real time.